Fairfield City School District has a long history of providing English as a Second Language services to students whose first language is not English. Our program began in the 1980s when General Electric transferred several families from France to the GE Plant in Cincinnati. Students attended Central Elementary School, and under the leadership of Dr. Gayle Niehaus our program began. Today we provide services to over 1,000 students. Our international student population includes over 40 different languages. The top four languages in our district are Spanish, Nepali, Twi, and French. All English Learners (EL) students in the Fairfield City School District are invited to participate in our ESL program upon registration in the district. The Enrollment Center packet for new students includes Ohio's Home Language Usage Survey. This document identifies the student's primary language and the primary language spoken in the home.If another language, other than English, is spoken in the home, students are screened to assess their English language proficiency. If necessary, the newly enrolled student will be placed in our ESL program. ESL is a multi-faceted program offering English language classes and content-area assistance to English learners (EL) enrolled in the Fairfield City School District. The goal of our ESL program is for students to acquire a level of English language proficiency that enables them to meet grade level promotion requirements, state-mandated graduation requirements, and ultimately compete successfully in mainstream society. There are three federal court cases that provide the legal foundation for providing equal educational opportunity to students with limited English proficiency: Lau vs. Nichols, 1973; Castaneda vs. Pickard, 1981; and Plyler vs. Doe, 1982. Fairfield City School District, in compliance with federal and state law, provides services to ELL students who qualify for our ESL programs. Our sheltered English Language Arts (ELA) classes are taught by ESL teachers who are licensed to teach ELA and who have a Teacher of English as a Second Language (TESOL) endorsement. The state ELA grade level standards are taught with a focus on strategies and best practices for students who are learning and growing in their English language proficiency (listening, speaking, reading, and writing). Currently, our K-12 ESL teachers use the grade level materials found in the core ELA class. The sheltered ELA classes are held during the regular school day and are considered the students' core English language arts class. ESL I and II provide a concentrated instruction on the four domains of language: listening, speaking, reading, and writing. The ESL teachers use National Geographic's curriculum (K-5, REACH, 6-8, INSIDE, and 10-12, EDGE.) They also use supplemental materials to meet the needs of the students, such as, Rosetta Stone, Read 180, and Study Sync. Best practices and strategies included in the program are Kagan structures, Orton Gillingham methods, conversations, games, discussions, video presentations, and writing activities. Students are also scheduled in regular classes where they practice their English skills and learn the content area state standards. These ESL classes are taught by TESOL endorsed teachers. 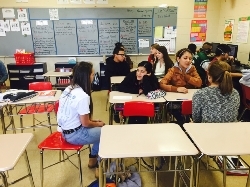 Small-group instruction occurs outside the students' language arts homeroom. The REACH program is utilized to supplement the core reading curriculum. Pull-Out support mainly takes place in the elementary setting and does not interfere with core English Language Arts (ELA) instruction. 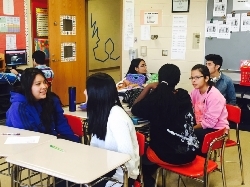 In-Class support (inclusion) is provided to EL students who are assigned to regular core content classes (English Language Arts, Math, Science, and Social Studies. They may provide support with understanding key vocabulary, comprehending the lesson, completing assessments, learning to participate orally in class, working on group projects. Teacher monitoring is provided to EL students who have achieved English proficiency. During monitoring, a teacher or tutor checks on the student’s academic progress to make sure the student is succeeding. Monitoring can continue for up to two years after the student is no longer receiving regular ESL support. If a student begins to experience serious academic problems that are related to their English acquisition, the school will provide appropriate ESL support. If another language is indicated on the Home Language Usage Survey, testing begins with the OELPS (Ohio English Language Proficiency Screener). This statewide test is interactive and completed on a secure browser for students in kindergarten through grade 12. The OELPS evaluates students’ listening, reading, speaking and writing proficiency in English, and provides data for identification within 3 hours of testing. Preschool students will still be screened using the IPT (IDEA Proficiency Test), as the OELPS is for grades K-12. State and Federal law require an annual assessment of K-12 Limited English Proficient (LEP) students to measure their English language proficiency. The Ohio English Language Proficiency Assessment (OELPA) is the assessment used for testing English language proficiency for Ohio LEP students in Grades K-12. Please click here for information about any other assessments administered by Fairfield.